Azulle, formerly known as Quantum Suppliers, just released the $170–280 Byte Plus mini PC. The Byte Plus upgrades several components on the already winning design of the Quantum Byte — but how does it compare to its competitors? In short, pretty good. 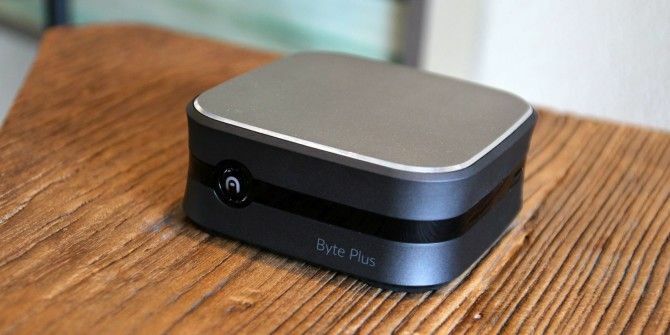 Azulle’s Byte Plus won’t stream 4K video or play modern games — but it’s everything you’d want from a compact and efficient mini PC What Makes Mini PCs so Small? And, the Best Mini PCs You Can Buy Today What Makes Mini PCs so Small? And, the Best Mini PCs You Can Buy Today A new generation of mini PCs is making its way into our homes and offices now. Read More . And on top of that, there’s no fan! The hardware profile of the Byte Plus doesn’t differ from a stick PC (what’s a stick PC? What Is An Android Stick Computer, And How Can You Use It? What Is An Android Stick Computer, And How Can You Use It? Miniaturization has been a computing trend for decades, but it seems to have accelerated over the past five years. Even Intel’s NUC (Next Unit of Computing), a hockey-puck sized PC, looks large compared to ARM... Read More ), aside from its form factor and superior cooling solution. While snappy under average computing loads, like streaming music, the Atom x5 processor can stutter and freeze when confronted with ad-ridden websites or running multiple tabs in Google Chrome. The Atom x5 System-on-a-chip (SoC) inside of the Byte Plus doesn’t compare with mainstream Intel Core Intel Core i3 vs. i5 vs. i7: Which One Do You Really Need? Intel Core i3 vs. i5 vs. i7: Which One Do You Really Need? Confused by the differences between Intel Core i3, i5, and i7 processors? Here's what you need to know in layman's terms. Read More (or even AMD A10) processors in performance. While the modern Atom x5 processor combines features from Intel’s mainstream processors, such as hyperthreading and 3D transistors, benchmarks indicate weak processing capabilities. In synthetic testing, it performs about on par with chips from around ten years ago. However, in real world scenarios, the Atom x5 runs all apps fluidly and with speed. The real issue with the Byte Plus’s base model is that it employs 2 GB of RAM and eMMC solid state drive (what’s an SSD? How Do Solid-State Drives Work? How Do Solid-State Drives Work? In this article, you'll learn exactly what SSDs are, how SSDs actually work and operate, why SSDs are so useful, and the one major downside to SSDs. Read More ). That’s not acceptable on a Windows 10 machine. Other systems do fine with 2 GB, mainly Linux and Android — or even the astounding Remix OS A Real, Android-Based Alternative to Windows: Remix OS 2.0 A Real, Android-Based Alternative to Windows: Remix OS 2.0 Read More . For multi-tabbed browsing and other tasks expected of Windows users, 2 GB of RAM causes frequent stuttering during multitasking, disk wear, and other performance problems. On top of that, Windows takes up a whopping 20 GB of space on a hard drive — that leaves less than 12 GB of space free on a 32 GB drive. Unlike SATA and NVMe SSDs, eMMC modules just aren’t built for performance. While they’re mostly faster than regular Hard Disc Drives, they can perform worse (or about the same) in sequential writes with deep queue depths. Here’s how the eMMC module inside of the Byte Plus benchmarked on CrystalDiskMark (tools for benchmarking CrystalDiskMark & CrystalDiskInfo - Valuable Disk Diagnostics For Free [Windows] CrystalDiskMark & CrystalDiskInfo - Valuable Disk Diagnostics For Free [Windows] There was once a time when I was a naive kid on a desktop who never even considered that I'd have to keep up with the health of my hard drive. Jumping from the world... Read More ). Within the mini-PC market, there’s a disturbing lack of diversity in processors, RAM, and storage capacity. That’s because Intel insists that the Atom platform use no more than 4 GB of RAM. The majority of devices in this price segment could, in theory, perform at a much higher level with faster storage options and larger amounts of RAM. Unfortunately, that would cannibalize sales of Intel’s mainstream Core series processors. At present, the sort of devices available on the mini-PC market tend to look almost identical to one another — except the cooling system. In general, if you’re buying a fanless mini-PC, the cooling system is the most critical component. An efficient heatsink allows a Cherry Trail processor to maintain its performance for longer periods of time. On top of increased snappiness, a better cooling system can improve system durability. So within the $200 market, how many other mini-PCs compete with the Azulle Byte Plus? The best known is the ASRock Beebox, which offers a unit with similar specifications, and barebones options, at a higher price. A smaller competitor is the Kangaroo Moble Desktop Pro, which costs about the same as the Byte Plus and offers almost identical specs. Of the two, neither really rivals the cooling system of the Byte. However, the Beebox is user-serviceable. A sane person wouldn’t use a mini-PC for complex rendering or video-editing projects. For the most part, users of the Byte Plus might find themselves web-browsing, visiting social media sites, streaming media, or even running wireless presentations. In all these roles, the Byte Plus functions in the same fashion as a $1,000 desktop computer. Provided the user stays within its performance confines, the Byte Plus makes a tantalizing value proposition on the grounds of its portability, reliable performance, and low cost. The mini-PC excels as an HTPC or light gaming rig. Most mobile games, such as Minecraft and Asphalt 8, run great. It also streams 1080p media with ease and it plays 4K content without issue. As far as gaming goes, the Byte Plus handles all mobile games you could throw at it. Asphalt 8 on Extreme settings runs fluidly and with a maximum temperature of 73 degrees Celsius after several hours of continuous use. Minecraft runs just as smoothly — even so, don’t expect to play the latest non-mobile games on an Atom processor. Not that you would want to install the Steam client, with only around 12 GB of free storage capacity. On the downside, the Byte Plus doesn’t stream 4K media, although it streams 1080p. Part of the reason it may suffer problems streaming 4K stems from its single-stream Wi-Fi card, the Intel 3160. The 3160 hits about half the speed of a wireless-AC 2×2 card and is about as fast as a dual-band 802.11n card. That’s fast, but not blazing fast for internal network speeds or streaming 4K video. I couldn’t test the Byte Plus’s performance in 4K playback. However, the Cherry Trail processor inside of the Byte possesses more than enough horsepower. What’s Missing in the Byte Plus? A strange omission concerning the Byte Plus is the lack of a USB Type-C port (what’s USB Type-C? What Is USB Type-C? What Is USB Type-C? Ah, the USB plug. It is as ubiquitous now as it is notorious for never being able to be plugged in right the first time. Read More ). At present, few desktop computers include the technology. Even so, USB-C would have given the Byte Plus an added degree of future-proofing. I’m not sure why Azulle chose to leave it out. Another feature lacking in the Byte Plus is user-serviceability. There doesn’t appear to be any means of dismantling the device or replacing parts. Compounding issues, users can access the BIOS (what’s a BIOS? Why Does My Motherboard Have a Battery? Why Does My Motherboard Have a Battery? Whether you’re using a desktop computer or a laptop, your computer’s motherboard contains an integrated battery. Unlike a standard laptop battery, the motherboard’s battery doesn’t power your computer while you're using it. Quite the opposite,... Read More ), which means the system can be rendered unbootable through accidental misconfiguration. If that happens, there’s no method of resetting the BIOS, which translates into a hard brick (that means a broken device). However, these problems aren’t deal-breaking in the slightest. Overall, the Azulle Byte Plus offers few vices and a lot of virtues. Should You Buy the Azulle Byte Plus? At around $200 the Azulle Byte Plus compares on equal footing to many of its small form factor competitors. In its niche, the Byte excels within several roles for two reasons. First, it can deliver unthrottled performance for a longer period than any stick PC with similar specifications. Second, it includes more ports, ethernet capabilities, and versatility than its competitors, which make it useful in a range of roles. For most users, it’s one of the best Cherry Trail mini-PCs around. If you need Windows 10 and a small, efficient PC, then Azulle’s device should satisfy your needs. On the other hand, it packs in similar specifications as a Chromebook, at the same price — and a Chromebook can fulfill most of the things that the Byte Plus can. Explore more about: MakeUseOf Giveaway, Mini PC. Great device to run Linux and use in a VDI environment to give a full windows experience. The Kingston 128Gb Micro SD XC I Class 10 is compatible to Azulle Byte Plus ? for microSD card expansion (up to 128 GB of expandable storage)? Supposedly it can handle UP TO 128GB microSD cards. I never was able to check this. The microSD card capacity and transfer speeds should be determined by the chipset. We've since given away the device, but I believe it was either handled by the Intel Cherry Trail SoC or by Realtek. In either case, that means 128GB capacity but unknown data transfer speeds. The Kingston 128GB SHOULD work but we don't know exactly how fast it will transfer data. The small computer is Ideal for people who do not have a lot of room , helping to keep in touch with the world. IT is looking good. There is definitely space for Mini PC's. The ones that are in market, are either too costly(mini mac) or not-so-reliable. A decent budget-mini pc has huge potential in market. LOL. I want it. It would be a good media player. LOL. I don't want it even for free.